Allow me to stand on my soap box…. 1. Children cannot learn actual swimming until they are at least FOUR TO FIVE years of age. As you know we stop teaching at 3 and almost all of our little ducks SWIM when they graduate. Those that don’t have either joined our program late or have had hit and miss attendance – as with most things in early life, consistency is key. We could fence on the term “actual swimming” for example freestyle is clearly a challenge for a toddler with short limbs and under developed core strength but since the definition of swimming is to propel oneself through water using the limbs, I think we’ve largely nailed it. 2. There is really no good information to indicate that babies under a year old can retain anything from lessons. A baby’s cognitive development is at its greatest in the first year. 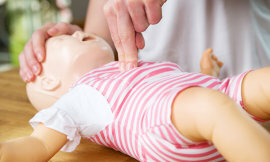 Even within the context of a “lesson” (and discounting the fact we are teaching carers as well as babies), the suggestion is that babies don’t really learn much before they turn one. If a baby loves water and is happy in the water, it is a learned response due to repeated exposure. Not to mention breath holding, word command recognition, crawling out of the pool turning around and facing mum, holding on to the side of the pool and some may even be able to blow bubbles. All those other little motor skills that engage automatically like kicking, reaching and splashing are also learned and remembered from lesson to lesson. 3. 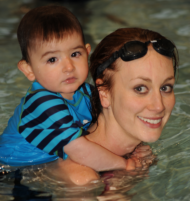 Children between one and four years of age may be able to learn enough to help, should they fall into the pool. However, it is absolutely essential that no parent should think that swimming lessons means a toddler or young child is safe around a pool. Young children must be supervised with someone in the water. Hooray! We agree on something! This is a really important point guys especially as your little one grows in confidence and ability. It’s too easy to drop your guard particularly if bub is water confident. It only takes a few seconds and even a few centimeters of water for something terrible to happen. 4. The most swimming skills can give a child is a few more seconds for you to rescue her if she falls in. No, no, no – there is so much more! Swimming, if taught correctly and enjoyed regularly promotes health, fitness, social skills, cognitive and motor skills development, water confidence and is of course a vital life saving skill. Not to mention plain ol’ FUN! Just take a look at little Aidan’s happy smile in the underwater pic above as he takes the plunge! Whilst for the really little ones the above may be true because they have yet to develop, let’s not forget our students past and present who, at aged as young as 2 years, can swim 5 meters or more unaided. Selina on our homepage video swam 8 meters at Kogarah for us and whilst not technically perfect freestyle, she has a great prone position, swims face in and repeatedly raises her head to breathe. In the latter stages of our program we are working on independent swimming and buoyancy skills which help the transition to mainstream learn to swim lessons. And underpinning the swimming skills is a program which focuses on helping children to learn about water safety. So in conclusion guys, don’t believe everything on the web, please remain vigilant at all times when your little one is swimming or even at bath time and most of all, ENJOY your lessons and especially watching your little under 5 SWIMMING!